Packed with almost 70grams of protein! If you’re constantly on the go but still like to eat healthy meals, then this recipe is just perfect for you – it’s very easy to make and it’s all done in one pan with a very easy cleanup! These Sweet n’ Savory Turkey Meatballs are packed with flavor without the laundry list of ingredients. They have a sweet, spicy, and tangy punch all in one bite – and each serving packs a punch with around 70 grams of lean protein! The best part? They should only take about 30 minutes to make! They also freeze well so you could apportion into your desired serving size and then just defrost as needed. 1. In a large bowl, combine the ground turkey, egg, garlic powder, onion, oats, salt, and pepper. Get your hands in there and mash it all together. (If you don’t want to use this, you can use a fork but ensure that it’s completely mashed). 2. Form mixture into approximately 1-in balls. You should form 12 meatballs for this recipe. 3. Spray a large nonstick skillet with cooking spray and place over medium-high heat. Once pan is hot, add the meatballs and cook until browned on both sides, flipping after approximately 4 minutes. 4. Stir together cider and brown sugar and add to skillet. Simmer for 2-3 minutes then gently remove meatballs with tongs or a fork to a large plate to avoid crumbling. 5. Add vinegar, red pepper, chili powder, and salt to skillet and bring to boil, stirring to scrape up any brown bits, until reduced to approximately 1/3 cup, about 5 minutes. Gently return meatballs with any juices on plate to skillet and simmer until meat is cooked through and sauce is thickened, about 3 minutes. 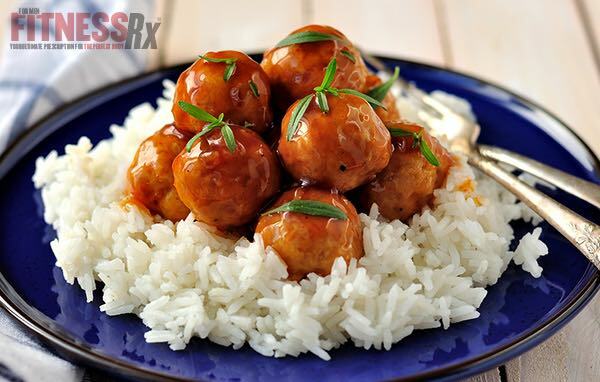 Serve with the sauce over white rice* (substitute pasta, brown rice, potatoes, vegetables…whatever you prefer).